Father Gary is from Cleveland’s east-side and was ordained a priest on June 7, 1986. After ordination he served as Co-Pastor and Member of the Pastoral Team at Our Lady Help of Christians in Litchfield. 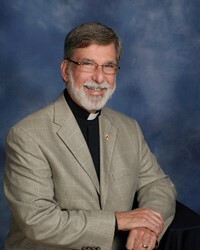 Next, he was Associate Pastor and Administrator at St. Mary in Elyria for ten years. Before coming to St Joan of Arc he was Associate Pastor at St. Gabriel in Concord Township and St. Francis of Assisi in Gates Mills. Father Gary has a doctoral degree in Biblical Theology and Homiletics and is an adjunct professor at St Mary Seminary and Graduate School of Theology. In his spare time, he enjoys music, traveling, reading, exercise, and relaxing with friends. 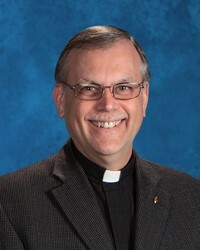 Father Gary joined St. Joan of Arc in 2011 and was named pastor in June 2013. Jeff spent most of his formative years in the Chagrin area. Growing up, his family were members of St Joan's Parish where he was active in the Boy Scouts and as an altar server. He attended St. Rita’s school and Gilmour Academy. He received a Bachelors Degree in Business from Georgetown University and is a CPA. Currently Jeff is employed as the Chief Financial Officer for Frantz Medical Development, Ltd and Subsidiaries in Mentor, Ohio. He was ordained to the Permanent Diaconate in the Cleveland Diocese in May, 2000. As a deacon, Jeff assists at Masses, presides at baptisms, performs marriages and officiates at burial services. He is also the RCIA Coordinator. In his free time, he enjoys reading, walking/hiking, the theater and cooking. Denny Guritza was ordained as a permanent Deacon in 2005 and serves his diaconal ministry St. Joan of Arc. Deacon Denny and his wife Diana (bride of 50 years) have 3 children and 6 grandchildren. Members of the St. Joan family since 1984, Deacon Denny & Diana lead the Pre-Baptismal Preparation Program at St. Joan’s for the local region. His was educated at Eastern Michigan University with a degree in Aquatic Biology along with an MBA from Xavier University in Cincinnati. Currently project work in developing Aquaculture opportunities, “ocean farming for families”, keeps Deacon Denny traveling to project sites. His favorite pastime, after centering prayer, is fly fishing on a quiet trout stream. Ann Marie was born into an American Slovak, Catholic family in Lakewood, Ohio who instilled a deep respect for priests, sisters, the Mass & Catholic education. She took her first vows in 1960 as a SND and in 2010 celebrated 50 years! Sister has studied at St. John College, Kent State University & the Notre Dame Institute for Advanced Studies. 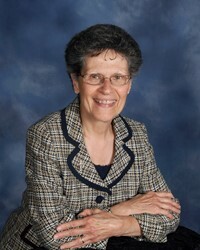 Sr. Ann Marie is a Certified Youth Minister and Lay Ecclesial Minister. Her ministry has included being a teacher and a principal in the diocese before coming to SJA over 20 years ago. At SJA she has been the Director of Religious Education & Pastoral Associate for Sacramental Programs and RCIA. She also ministers in nursing facilities, is involved in weddings & funerals and is a staff advisor for many organizations at SJA. – IT IS A WONDERFUL LIFE! Judy has been in Religious Education for 14 years, the last 12 at SJA. 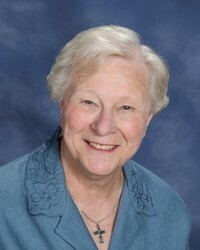 Before beginning this ministry, it had been her privilege to teach primary children for many years in the Youngstown and Cleveland Dioceses. Being raised with an older sister and younger brother in an Italian-American home, and part of a large extended family, has given her a deep love for family, family traditions and wonderful memories! Some of her SND opportunities were to give religion workshops and be part of a Review Team for Loyola Press, to give in-services to new teachers in the diocese, and to be a director for young women who are beginning their discernment for religious life. Sr. Judy feels she is especially blessed to witness to God’s Goodness within the many ministry opportunities she has at SJA! Shelley is the principal of St. Joan of Arc Catholic Day School and she has a deep commitment to Catholic education. This year she is completing her 19th year here as principal, but she also taught at St. Joan’s 40 years ago. Shelley began her teaching career here at SJA in 1974 and she taught for four years before retiring to raise her own children. Upon returning to the classroom she taught at St. Rita’s in Solon for 10 years and at St. Gregory the Great for 3 years. 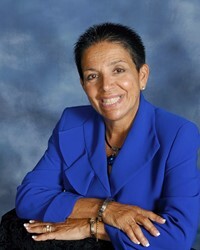 While teaching, Shelley went back to Ursuline College and earned her Masters Degree in Educational Administration. She is married and has 3 children and 4 grandchildren. In her spare time Shelley loves beach vacations, reading and working out. Patrick is the Director of Music for St. Joan of Arc Parish. 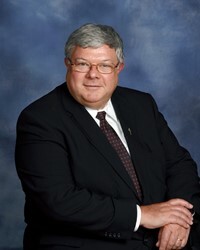 He has been a member of the staff since January of 2011. 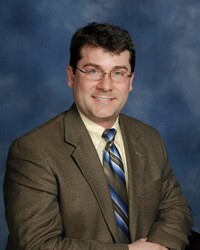 At SJA, Patrick is responsible for coordinating a music ministry within the Catholic tradition. This includes maintaining several musical ensembles and a cantors guild, as well as playing piano and organ and cantoring among many other things. Patrick graduated with a Bachelor of Music from Oberlin College Conservatory in 2005 and earned a Master of Music from the Cleveland Institute of Music in 2007. Originally from Omaha, NE, Patrick has been a resident of Cleveland for the past twelve years, studying and working in his field. In his spare time Patrick enjoys reading and exercising out of doors in warm seasons. Allie is the Coordinator of Youth Ministry at St. Joan of Arc Parish. A Cleveland native, she grew up in Solon and recently moved to Bainbridge. 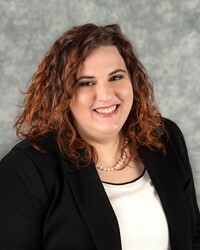 She is a graduate of John Carroll University, where she is also completing her master's degree in nonprofit administration. While this is her first full-time ministry position, Allie has many years of experience volunteering in many youth ministry roles at Church of the Resurrection. Allie's vision for youth ministry at SJA includes helping teens be able to use and express their faith in real-life situations and teaching them how to live a prayerful, spiritual life and how to understand events in their life through the lens of their faith. In her spare time, Allie enjoys playing violin, singing, crocheting, and art projects. She also enjoys spending time with her dog Ricky and doing yoga.